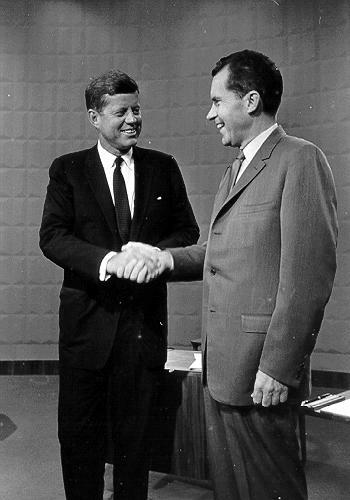 Handshakes are the traditional part of greetings and partings in business. Shake hands with a client, partner or colleague every time you meet them and before the goodbyes. The exceptions are co-workers that you see everyday in your office. You don’t need to shake hands with them, unless there is a special reason. If you are congratulating someone or a person was away for a week and you’re really glad to see him a handshake is totally appropriate. Never leave a person you are greeting with his hand extended in mid-air as you refuse to shake it. If you refrain from the traditional greeting it will be close to impossible to re-establish good relationship. Unless you explain yourself, your partner will be stuck at thinking what did he do to make you angry. In the past a man couldn’t offer a handshake to a woman unless she initiated it. Nowadays, at least in the business environment, this custom has changed and it is absolutely acceptable for a man to reach out first. At the same time hierarchy and rank do matter. Let’s say you work in a big firm and you incidentally meet the CEO of your company in the lobby. As a senior executive of the company he should initiate shaking hands with the person in lower management. If you are a visitor in an office, for example you walked into to sell something, you should wait for the company representatives to initiate the handshake. On the same principle, you should always initiate the handshake with a client who came to see you and make him feel welcome in your organization. You reach your hand out and you go all the way in until your web touches their web. Your palm should completely touch their palm. Firmly pump your hand for 3 times. While shaking hands use the person’s name: “Hello Amanda, it is a pleasure to see you!” Remember to look the person in the eye. Phyllis also advises to slightly raise your eyebrows for sixth of a second when saluting the person. This is almost unnoticeable, but gives your partner a sense that you trust him. The handshake should be brief and shouldn’t take more than four seconds. While a limp “dead fish” type of handshake is a bad idea, a forceful grip is not a good one either. The ideal business handshake is a respectful and friendly gesture. When shaking hands use about the same level of grip you would use for opening a door handle. Always stand for a handshake. There are only two exceptions to the rule. First is if you have a physical disability and can not stand. Second is if you are in a booth where it is not possible to stand. In such case do kind of a courtesy bow. Put one hand on your chest, raise yourself a little, and reach across to initiate the greeting. 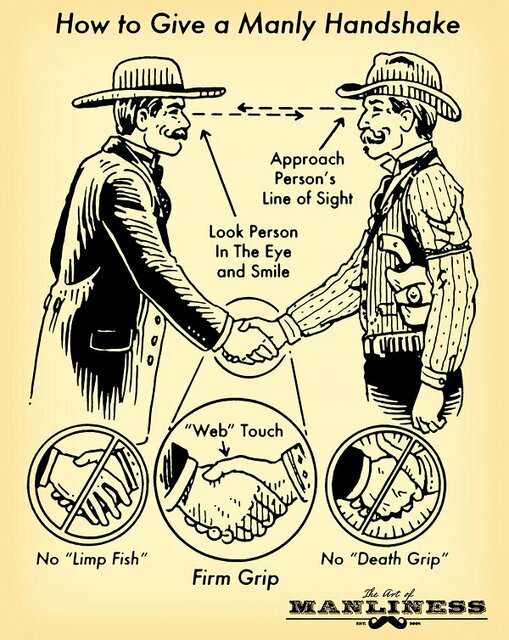 A firm handshake in the traditional form of greeting In North America and Europe. In Japan the bow is the equivalent of shaking hands. Though the handshake started to be more popular in India and Thailand, still the traditional approach in these countries is placing the hands together at chest-level, prayer-like, and bowing. When visiting Asia or the Middle East keep in mind that the customary grip is gentler; too firm handshake can be defined as aggressive. Also, keep in mind that women do not shake hands in some muslim country. Because the customs vary religion to religion, it is better to wait until the woman initiated a handshake. In many Latin American countries and in South Europe a handshake can be accompanied by a touch on the forearm or elbow. In general, if you visit a country for the first time it might be a good idea to find out what is the expected way of greeting there. Do you have questions about handshake or you think we forgot to mention something? Come talk with us! Leave a message below. As a Muslim, how can i refuse to shake hand with a man without feeling him insulted? what to say in this situation? Hope it helps! Please let us know if you have other questions!